Limited Edition of 950 prints 15" x 19", 1992. The most frequent question I get asked is "which town are you doing next?" The next question is: "how do you decide what to include?" Well for my Chester painting I was spoilt for choice. In previous Cheshire towns I included most of the notable buildings and landmarks, but here within and outside the Roman walls, there was an abundance of riches. 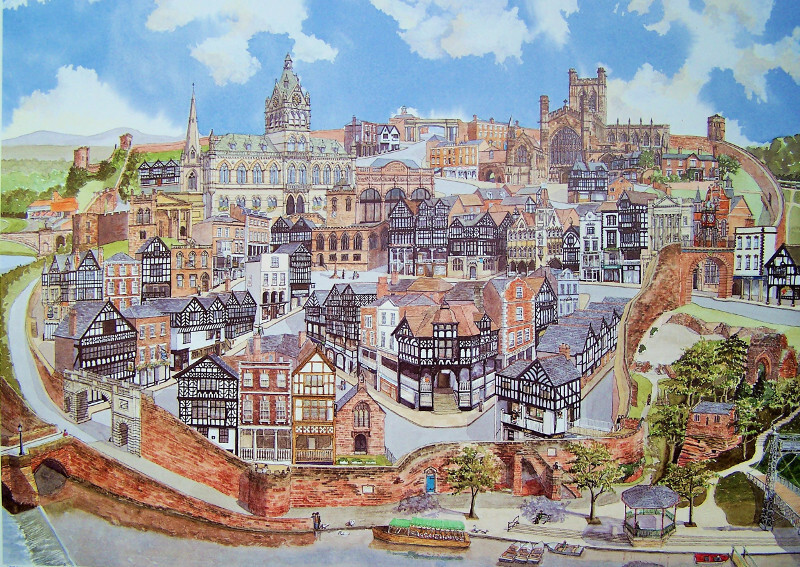 Many substantial and historic buildings had to be discarded, but having walked the walls and criss-crossed the centre, those things that I wanted in my Chester cityscape slowly started to register in my mind. The elements I chose seem to have given the flavour of this unique city, and I can only apologise to those who think this, that or the other, should have been included. The Romans constructed their fortress here at the lowest bridging point of the River Dee in AD80, and stayed for 300 years. Their street layout linking the north, south, east and west gates remains within the walls which themselves were extended in the 10th Century using the warm local sandstone. The Benedictine Abbey founded in 1092 later became the Cathedral and is basically a medieval building. 'The rows' appear in my Chester print, these are galleried shopping arcades above the ground floor shops and stretch for a considerable distance along the main streets. Notice too in the left of the picture England's oldest racecourse on the "Roodee". A copy of my Chester painting ended up in the Prince of Wales' collection at St James Palace, that delivery trip was a different day out.